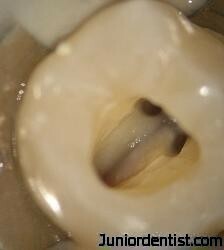 It is done when the patient wants to preserve the natural tooth structure without it being extracted. When there is a fracture to the tooth where the pulp tissue is damaged due to the trauma caused to it. If the pulp infection reaches the bone, and root canal treatment is not done there will be an abscess formation which may lead to extraction of the tooth and treating the affected bone. There are certain Contraindications in Root Canal Treatment depending on many factors which have to be considered and depending on that the alternatives to Root canal treatment are indicated for which are mentioned below. 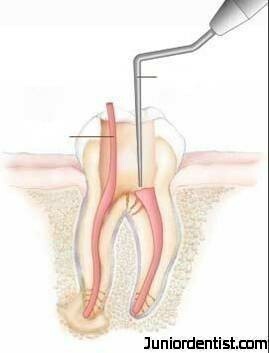 Extraction is the only alternative to root canal treatment. A swelling with pus in the area around the tooth. A swelling that may spread to other area of the face. Abscess formation around the root tip. If neglected for long a Sinus or a drain hole is formed starting from the root draining its contents to the outside. A tooth that hurts significantly when pressure is put on it, by biting on something or sometimes even on touch. Sensitivity to different modalities like heat, cold, pressure etc..
Discoloration of the tooth with or without pain. Discoloration of the tooth after trauma to the tooth, which indicates that the tooth is becoming non vital. Diagnosis using IOPA or RVG: The procedure of root canal treatment begins with the diagnosis of the infected tooth, The diagnosis is done with the help of the above mentioned symptoms and the main and the final diagnosis is done after taking a radiograph of the suspected tooth. IOPA or Intra oral periapical radiograph is one method and the latest method is the RVG. Using these Radiographic methods it helps in determining the tooth affected, extent of lesion present, number of Roots, number of pulp chambers and the anatomical variations in the root. The infected region can be detected by slight discoloration in the region from the normal and the presence of infection in the apex of the root as shown in the image. After taking a Diagnostic X-ray, the next step is to gain access to the pulp chamber which is done with the help of an Access Opening. 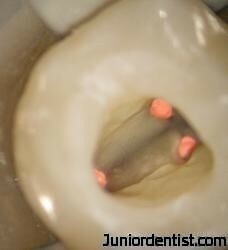 The Access cavity preparation is the first step to a successful root canal treatment. 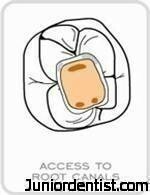 Access canal should be prepared in such a manner that it provides unrestricted access to the pulp chamber below and allows extirpation of the pulp tissue completely. 1 Straight line access: A straight line access means the instruments used in BMP like – Files (manual or rotary) should be entering the pulp chamber in a straight line without any restriction. 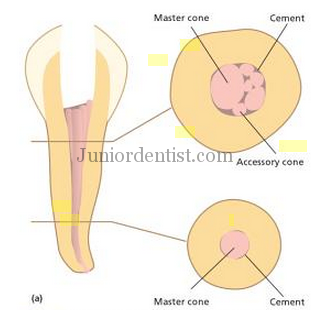 2 Conservation of Tooth Structure: With an infected tooth already weak due to caries, it is important to make sure that as little as sound tooth structure is removed. This helps in providing strength to the remaining tooth structure in bearing occlusal forces. 3 Unroof pulp chamber and expose pulp horns: Pulp horns are present in every tooth where the pulp chamber extends into the crown in the form of horns. The main criteria is to clean and clear all the pulpal tissue from the pulp chamber as remnants can lead to re-infection. BMP is divided into multiple aspects – Working length determination, Irrigation and Cleaning and Shaping of the canal to prepare the tooth for Final obturation. These files are used based in the width of the root canal as it is different in different teeth and in different individuals. There are many types of Root Canal Shapes which should be considered during BMP after identifying the type of Root Canal morphology the access cavity shape should also be altered accordingly. These files are then inserted into the root canals from the occlusal surface to clean the infected root canals by removing the pulp tissue. These files are flexible to ease the procedure as the root canals are not always straight they are seen with many curvatures at the tip. Above given is the infected tooth which has to be operated on by the root canal treatment, seen in it is the caries infiltration in the Enamel and Dentin which is extending into the pulp, and seen in the root apex is the formation of an abscess. 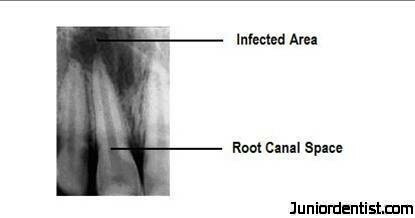 After removal of the pulp tissue from the root canals, the empty root canals are then cleaned with disinfectant irrigating solutions, to make sure that no infected tissue remains in the canal which is capable of causing the infection again. Then after successfully rinsing the root canals, gutta-percha points are placed into the empty root canals to replace the pulp tissue which was removed. 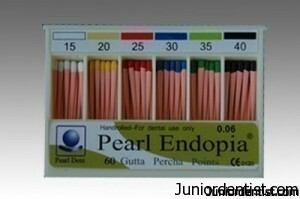 These gutta-percha points are available in different sizes so as to completely fill in the root canal which was emptied, the gutta percha points are adapted with the use of pressure into the canals with the help of a plugger or a dental instrument with a tip to put pressure on the gutta-percha points. 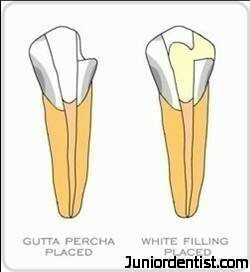 The gutta-percha points are placed into the root canal by applying cement onto them so that they are well adapted to the walls of the root canal. After the root canal is filled with the gutta-percha points an X-ray is taken to see weather the points are in place and weather there is any gaps. The gutta-percha point must fit well enough so that you know with the utmost predictability what the final result will look like, even before you complete the procedure. If the preceding instrumentation has been done well the point will be very easy to fit and the result will be predictably excellent. After confirming that the gutta-percha points are well placed then comes the turn of the restoration to be done to replace the tooth structure removed during the cavity preparation. Mainly a tooth colored restoration is preferred by the patients for the aesthetics to be maintained, The success of the Root canal treatment is confirmed by taking a radiograph after the complete restoration is done. This is one of the most important part of the treatment where the access cavity prepared needs to be filled with an ideal material which can bear the vertical stresses of occlusion, bond to the tooth structure to prevent micro leakage. Here is a list of Ideal Restorative materials used after Root Canal treatment – Ideal Restorative material after Root Canal. After restoring the tooth, an Onlay ( in case of sound tooth structure) or Complete Crown (in case of loss of any wall of the treated too) is required to increase the longevity of the tooth treated. There are many types of crowns – Metal, Metal Ceramic, Zirconia etc. Nice post there, really helpfull for many students. very nice description of procedure bt u should mention the name of the instruments as well. Great work and information Varun. Extraction is the best option for alternative treatment.